When considering all acute knee injuries, disruption of the extensor mechanism is a rare occurrence. More commonly, this involves fracture of the patella followed by failure of the quadriceps or patellar tendon. Failure of the quadriceps or patellar tendon most commonly occurs at the bony attachment site of the patella. Failure of the patellar tendon is more frequent than that of the quadriceps tendon. Quad tendon failure is more common after the age of forty and in patients with systemic disease. Patellar tendon failure is more common at ages less than forty. Patients typically describe a direct blow to the anterior knee or an eccentric contraction of the extensor mechanism against a flexion force. Upon presentation patients may describe a pop or tearing sensation at the time of injury. On examination patients will present with weakness of knee extension. With failure of both the quad or patellar tendon and the medial and lateral retinaculum patients will be unable to extend the knee against gravity. In cases without excessive swelling, a palpable defect can be felt in the quad or patellar tendon. 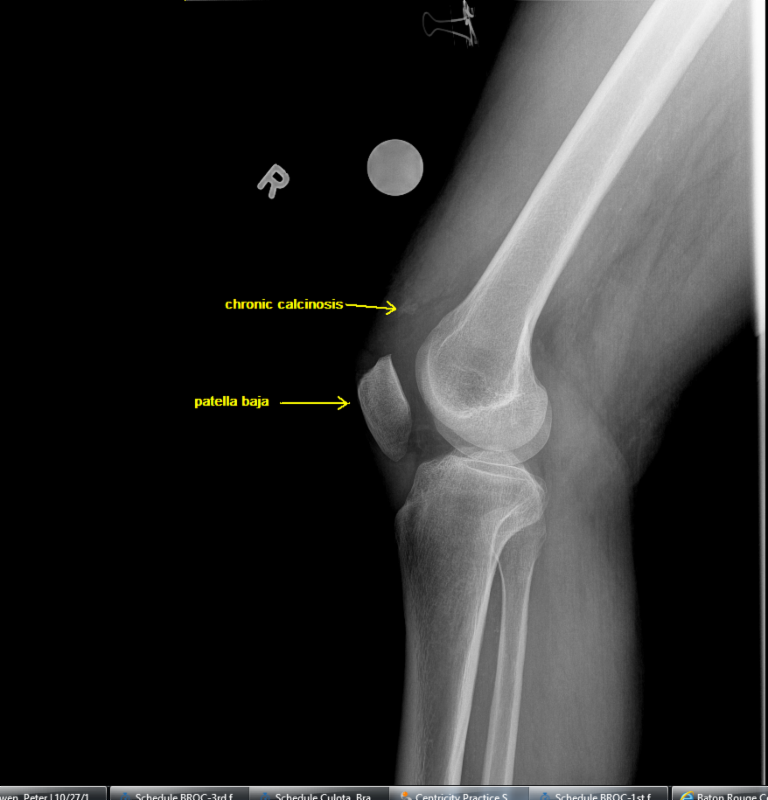 Radiographs in quad or patellar tendon failure may show an avulsion fragment or calcific changes evident of chronic tendonosis. When evaluating knee radiographs patellar baja maybe seen in quad failure and patella alta in patellar tendon failure. Unless other pathology is concomitantly suspected, further diagnostic testing is not needed. Richards DP, Barber FA. Repair of Quadriceps Tendon Ruptures Using Suture Anchors. Arthroscopy 2002; 18: 556-559. West JL, Keene JS, Kaplan LD. Early Motion After Quadriceps and Patellar Tendon Repairs. Am J Sports Med. 2008; 36 (2): 316-323. Siwek CW, Rao JP. Ruptures of the Extensor Mechanism of the Knee Joint. J Bone Joint Surg Am. 1981; 63: 932-937.